"The Department of Homeland Security has outlined what we've all known for some time - that border agents are allowed to snoop through files on your computer, mobile phone or any other digital device. "Officials can keep documents or computers, take them to an off-site location, copy the contents and share the data with other agencies. If there is no probable cause to keep the information after this it must be destroyed. A San Francisco court upheld the right of border agents to search laptops even without reasonable cause back in April." "To qualify as 'checkpoint friendly,' a bag must have a designated laptop-only section that unfolds to lie flat on the X-ray machine belt and contains no metal snaps, zippers or buckles and no pockets. "Among the manufacturers selling TSA-approved laptop bags are Mobile Edge, Skooba Design and Targus Inc."
"A Chinese-language blog responsible for leaking photographs of a genuine next-generation Apple 15-inch MacBook Pro casing has posted a similar set of photos purported to be that of the company's upcoming aluminum 13-inch MacBooks. "The four photos (below) published by Apple.pro show a hollow 13-inch aluminum notebook display casing with the word 'MacBook' imprinted on the bezel. "Last month, the same blog published a single photo showing the empty shell of what was said to be Apple's next-gen MacBook Pro enclosure. People familiar with the upcoming notebooks later confirmed to AppleInsider that the enclosure in the photo was indeed authentic." Editor's note: However, AppleInsider cautions that this latest batch of alleged spy photos, unlike the earlier ones, appear to have been doctored somewhat, so should be taken with a proverbial grian (sic) of salt. "A relative newcomer to covering Apple's financial health, UBS Investment Research is beginning its examination of the electronics firm with a positive outlook on the 'stickiness' of the company's brands but also the assertion that it has had to delay shipping a new ultra-mobile Mac. "Analyst Maynard Um echoes analyst reports and leaks that anticipate new Macs (including a revamped MacBook line) and iPods in the second half of 2008 but cites industry checks which point to a 'sub-notebook' originally intended for this year but which has allegedly been pushed back to a launch for the first half of 2009." "You can never be sure what advances will find their way into the next round of Apple hardware updates until practically the moment Cupertino makes the big announcement. But that doesn't mean it's not fun to guess a little bit. "So what can you expect in the next round of Apple laptops? Apple may, as Shrout contends, switch to an Nvidia chipset and keep the Intel processor. Apple may dump Intel entirely, and adopt an AMD processor and a chipset from AMD's 2006 acquisition, ATI. Apple may stick with an Intel processor, but switch to an ATI chipset. Apple may stick with Intel for both processor and chipset, embarrassing all the rumormongers. Apple may stick with Intel processors, but design its own chipset, much as the company did in the pre-Intel days." Link: What Will Be in Apple's Next Laptops? "After my first article on Macs and OS X, there were several readers who just down right bashed Macs for pricing and OS X without solid reasoning or legitimate hand's on experience of Macs. So this is a follow-up. "Let's get straight to the point. Tom's Hardware isn't about being a 'PC fanboy.' It's about finding the best hardware, revealing up and coming tech and debunking predetermined notions. That begs the question, especially here: what's so special about a Mac anyway? "Here's the short answer: nothing really, just some very elegant aluminum chassis designs. The key, is the operating system. Even still, let's settle this issue about price. "...you can always buy a cheaper car to get you from A to B. Instead, let's see what you can get for $2000, from Apple and from others. For $2000, do you really get much less? "Let's take a quick look at some of Apple's competition and their pricing structure compared to Apple's...."
Editor's note: the results may be an eye-opener for some. "I use a Dell Inspiron 1100 to do many of my blog posts while I'm in bed. It's handy to have it hooked up to the wireless network in my house and be able to blog from anywhere. I've had this computer for about 4 years now. It has been nice and I've had no reason to upgrade until now. "I've dealt with the fact that the Inspiron sounds like a hovercraft getting ready to take off from my lap. The fan has to kick into overdrive just to keep the thing cool. "Last night I was able to use an Apple MacBook Pro to submit my last blog post. What a freaking dream machine! My wife was using the hovercraft and my brother-in-law had left his MacBook Pro at our house. He has urged me to use it anytime I can. I'm now convinced he works for Apple and gets a commission when he gets people like me to use their products, fall in love and get one for myself. "I want to marry the Apple MacBook Pro." "When faced with the dilemma of upgrading my iBook G4 in June, I started looking for a replacement that would have the same performance as my Intel iMac. I decided upon getting a MacBook Pro 15". With money in hand, I eagerly clicked the 'buy now' button on Apple's website. Little did I know that I would be trading in my MacBook Pro more than 6 times over the next 2 months." PR: If you're the lucky owner of a MacBook Air, you'll know want to give this beautiful machine the protection it deserves. 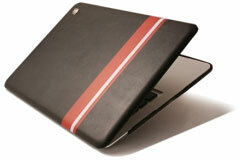 Proporta has introduced two MacBook Air cases, both very different from each other, but both attractively designed. The Profile Case (MacBook Air) is made from a thin, yet really tough polycarbonate and covered in a stylishly designed soft leather wrapping. The MacBook Air Profile Case, with its funky stripe design is the perfect accessory to keep your device protected from scratches and dust invasion. Complete with rubber grips to keep your MacBook Air stable whilst in use. Tilt the case's "feet" to elevate your MacBook Air for ergonomic usage and take advantage of the rubber grip points to allow your MacBook Air to remain stable when in use. The MacBook Air Profile Case is a unique design to Proporta and forms part of the Proporta Limited Edition Range, meaning you'll need to get your hands on one quickly as there are only 10 of these cases available. For a simpler design, try Proporta's Classic Sleeve - MacBook Air. This custom design fits the exact specifications of your MacBook Air and keeps it completely protected whilst it's not in use. Also check out Proporta's 4 Port USB Compact Hub. The easiest way to add extra USB ports to your PC, Mac or Laptop computer. Perfect for your MacBook Air. Two more MacBook Air models this week, one more 15" MacBook Pro ($1,649.00) and one fewer 17 inchers plus the 2.1 GHz MacBook has dropped 50 bucks to $899.00. Each model comes with an Apple one-year warranty, and ground shipping is free.